Bio: The 600 Wonder Woman is inspired by the design of Wonder Woman in Wonder Woman Issue #600. The issue was release in August 2010 and was game changing for the character. It introduced Wonder Woman to an alternate timeline created by the Gods in which Paradise Island had been destroyed and the Amazons scattered around the world. In this timeline, Diana is an orphan raised in New York. She is learning to cope with her powers. The entire world has forgotten Wonder Woman’s existence and the main story of this run was of Diana trying to restore reality even though she does not properly remember it herself. 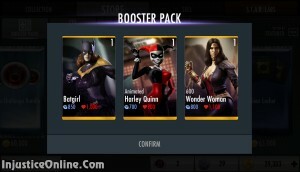 Amazonian Fury: All FEMALE characters on Wonder Woman’s team receive +30% DAMAGE and POWER generation. Shield Toss: Wonder Woman uses her shield as a projectile taking her opponent unawares. Aegis Wrath: Wonder Woman combines shield and sword strikes to crush her opponent. BLEEDING damage over 8 seconds. Justice Javelin: Wonder Woman calls in allies to help annihilate her opposition. UNBLOCKABLE. Daughter of Zeus: +10% Health for all Wonder Woman characters. Strength of Demeter: +10% Damage for all Wonder Woman characters. Amazonian Origin: +10% Energy Regeneration for all Wonder Woman characters. 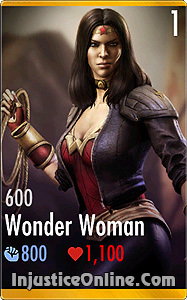 600 Wonder Woman is one of the strongest characters in the game. She is only weakened by the limitations of her passive abilities which only work on female team members. 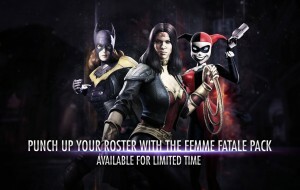 She can however be combined with the other two female characters from the Femme Fatale Pack (Animated Harley Quinn and Batgirl) to form a really deadly team. how to promote ww600 to levev 7 ???? I have ww600 level 2 , and cannot to buy any more..